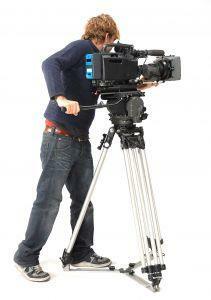 Are you interested in learning more about movie production jobs? While the idea of making movies may sound like a lot of fun, entering the field requires specialized training and skills. Making movies is a very complex undertaking, requiring the talents of many skilled workers. If you're interested in working in movie production, one of the first things you'll need to do is decide which aspect of this industry appeals to you the most. Working in movie production requires specialized skills. If you want to work in this profession, you'll need to complete a formal training program designed to provide you with the skills necessary for success in this field. Many schools offer training programs designed to meet the needs of individuals interested in pursuing a career in movie production. If you're committed to enjoying success in this field, you'll want to enroll in and complete a relevant program of study, gain hands-on experience through an internship, and build an impressive portfolio. Traditional Degree Programs - Many colleges and universities offer undergraduate and graduate degree programs in film production and related fields. While the titles of programs may vary from one school to another, these types of programs are usually offered through either a Fine Arts or Communication Arts department. The Art Institutes - With more than 40 campus locations and online educational opportunities, the Art Institutes can be a convenient choice for those interested in beginning a career in movie production. The school offers a variety of diploma and degree programs in media arts, including those specific to video production, digital film making, audio production, and more. Programs of study vary by location. Each Art Institutes campus offers extensive career services assistance to students. Full Sail University - Located in Orlando, Full Sail University is recognized as one of the top schools specializing in media arts. The school offers Bachelor's degrees in Film, Digital Arts and Design, Computer Animation, and other fields related to the entertainment industry. The school offers comprehensive career development assistance, assigning each student to an advisor with contacts in the particular area of the industry he or she is interested in working in. The Los Angeles Film School - Located in L.A., this school offers Associate of Science degree programs in film, computer animation, recording, and game production. The school's training programs emphasize all aspects of the process of making movies, and students benefit from an extensive career development program. Once you have acquired the skills necessary to work in the field of movie production, you'll be ready to begin apply for jobs. To apply for employment in this field, you'll need both a resume and a video or film reel that highlights your skills and experience. You should work closely with the career services department at the school you attended, as well as begin an active job search on your own. To look for movie production jobs, it's a good idea to compile a list of production companies that you can contact to find out about job openings. You can find contact information for many production companies on ProductionHub.com, LA411.com, and Business.com.